Different is a good thing! Why settle for ordinary? 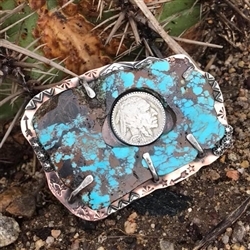 This giant natural slab turquoise features a hole that perfectly fits a Buffalo Nickel. It is set on a hand-cut copper belt buckle that features southwestern stamping.